So the holiday season is upon us. Yes, I said HOLIDAY season. So sorry if that “offends” anyone! Yesterday was Thanksgiving, soon it will be Hanukkah , the Christmas, then the New Year. So yes, it is a HOLIDAY season. I have seen a lot of things online, how we should ONLY say Merry Christmas, and not Happy Holidays. I don’t get that – because, well, not everyone celebrates Christmas! I saw someone else say, that it is the ADVENT season, and we shouldn’t say Christmas, because the “Christmas” season, doesn’t actually start until December 25th..
Christmas or Christmas Day (Old English: Crīstesmæsse, meaning “Christ‘s Mass“) is an annual religious and cultural holiday commemorating the birth of Jesus Christ, celebrated generally on December 25 by billions of people around the world. A feast central to the Christian liturgical year, it closes the Advent season and initiates the twelve days of Christmastide, which ends after the twelfth night. Christmas is a civil holiday in many of the world’s nations, is celebrated culturally by an increasing number of non-Christians, and is an integral part of the Christmas and holiday season. Call it whatever you want, I really don’t care, just be happy and kind to one another! I have seen a lot of people say “Put the CHRIST back in Christmas”. Well, if that is how YOU celebrate then yes. And be sure to do something CHRIST like this season! There are so many people in need, kids in the hospital, the homeless, those that need just an extra hand. Do SOMETHING for them, and stop complaining about how people don’t SAY the right thing!!! have your ACTIONS show what Christmas really means to you. I use to Love Christmas time. I loved all the movies on TV, the gift buying, the decorating. But when Alexander was diagnosed with STUPID cancer, I didn’t care much about it, and even less so since he died. He spent Thanksgiving and Christmas in the hospital in 2010. He was VERY sick on Thanksgiving and we were alone (some day I will get over being bitter about that one!) We made Christmas as nice as we could, but really, it was in the hospital so how nice can that be!? He was little enough to not notice, but of course we did. After he died, I REALLY didn’t care any more! I am starting to get a bit of the Joy back now that we have Julia and Elizabeth. Julia has some books about Christmas that she likes to read (and we have been reading since September!) and she has a Curious George Special that she likes to watch (over and over and over again!) When we were putting up Gold decorations in September for Childhood Cancer Awareness month, she kept saying “Christmas time!”. It is fun now with her, and I am sure next year Elizabeth will be into the season too. It is still hard though to be truly happy. A lot of my Angel Parent friends say the same thing. Life is never the same after you lose a child. You go thru the motions for your family, but really you just want to curl up in a ball and cry, because you will never have a perfect holiday again. Sending out Christmas cards becomes a conundrum for a bereaved parent. You want to some how include your child that has died, yet, figuring out the best way is very hard. Some people hold a picture of their child that has died, some leave that child out all together. 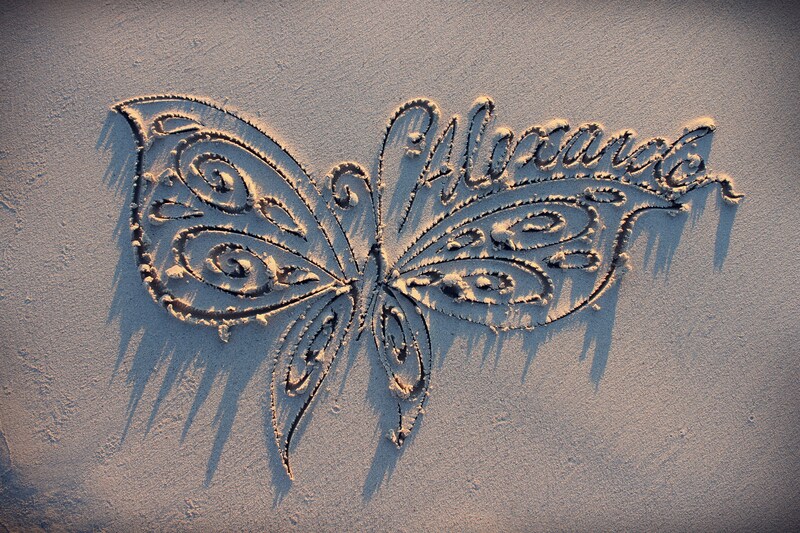 Last year, I added a butterfly with Alexander’s name on it that was written in the sand. Another time, I included a family photo that we had taken in front of a picture of him at a Road Race we took part in. As you go about the next few weeks of the HOLIDAY season, remember, you never know what someone else is going thru. This could be a hard time for them for many reasons. Loss of a loved one, sickness, or any number of things. Be kind to those around you. Last night I had a dream that I was on a roller coaster. It was a crazy ride, but the scary part was that the roller coaster was falling apart as we were riding it! I often feel like my life is like that. A crazy roller coaster ride that is sometimes falling apart. Back to the roller coaster ride. Throughout the weekend, we have parent groups. We talk about our children that have died during this time and how we are dealing with that. Everyone has a different and special story. Some parents had only lost their children a few months ago, some many years ago. It is hard to hear these stories, but it is also nice to know that we are not alone in our grief. At one point during the weekend, I couldn’t find the baby wipes I had been using in the dinning hall. I went into a panic. Now, I know what many of you are thinking “a panic? over WIPES? !” Yes, that is what happens when you lose a child/ Even the smallest of things can send you into a full blow panic attack!!!! Honestly, I don’t remember being THAT much in a panic when Elizabeth was having her open heart surgery! I continue to be told by others that they are “inspired” by me. I am not sure why. I guess it is because they wonder how THEY would be if their child die. I suggest though that you don’t think about that, because, you don’t know how you would be, and I don’t ever want anyone to know! What I would like, is to INSPIRE people to DO good things in life. If you are going to look at me, see that I am not in a puddle on the floor (although there are many days I WOULD like to be!!!) 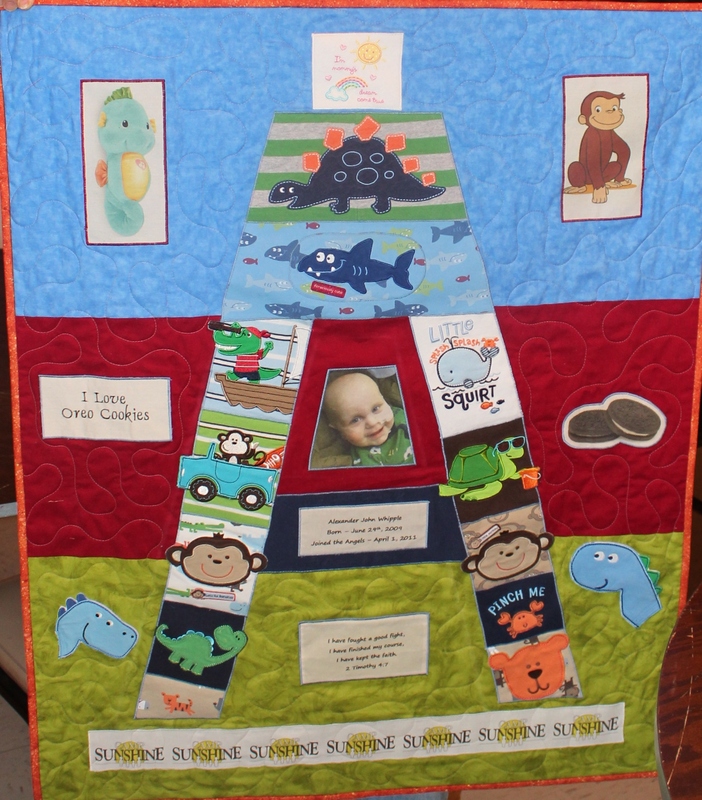 There are so many ways to help those in need, and not just kids fighting cancer! I know many families that have started foundations, organize blood drives and hold huge fundraisers. That is wonderful, but to me that is VERY overwhelming! If you have the time and energy to do a big event, then GREAT! But if not, think on a smaller level. Maybe, instead of giving gifts to the adults this year at Christmas, consider donating that money to charity. After I turned 40, I decided I didn’t want Birthday Presents anymore, instead, if someone wanted to do something for me, I asked for donations to be made to Birthday Wishes. Birthday Wishes is a group that holds birthday parties for children that are homeless. Okay – I think I am going to get off the Roller Coaster ride for tonight and maybe actually go to bed early!